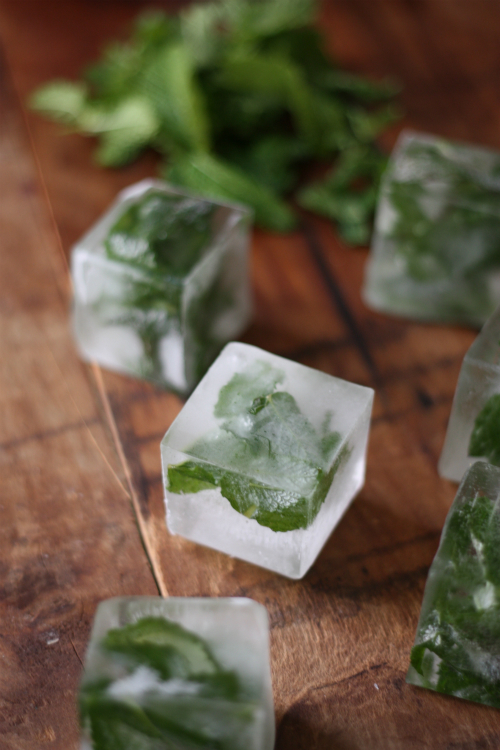 Summer screams for large ice cubes and cold beverages — this time of year Tim and I love making herb-infused ice cubes to incorporate into our seasonal cocktails. 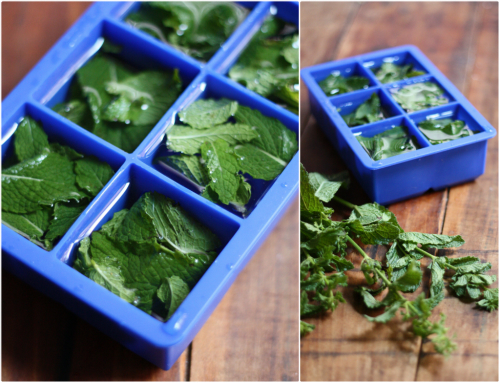 We packed leaves of fresh mint from our Farm Table delivery box into these over-sized silicone ice trays we picked up from The Meat Hook during our last trip to Brooklyn. These trays are pretty easy to find around — here's a link to them in our Amazon shop to get more details. They make those perfectly large sized cubes that go in a single tumbler and give off that old fashioned cocktail feel. 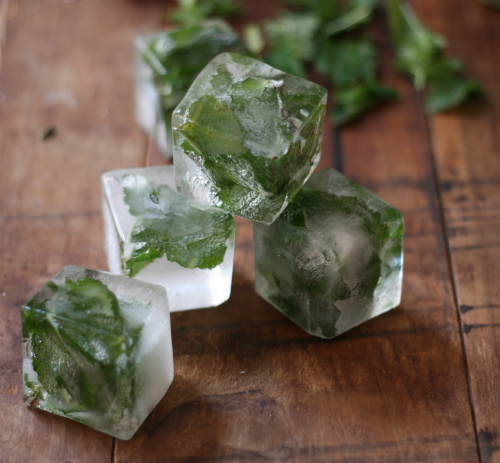 Once removed from the trays, the mint-infused cubes of ice are like little works of art, encapsulating and preserving a sort of timely little treasure. It's fun to see how the water froze around each mint leaf and try to spot the little details on each one. It's definitely not brain science, but these kinds of ice cubes always feel a little magical somehow. 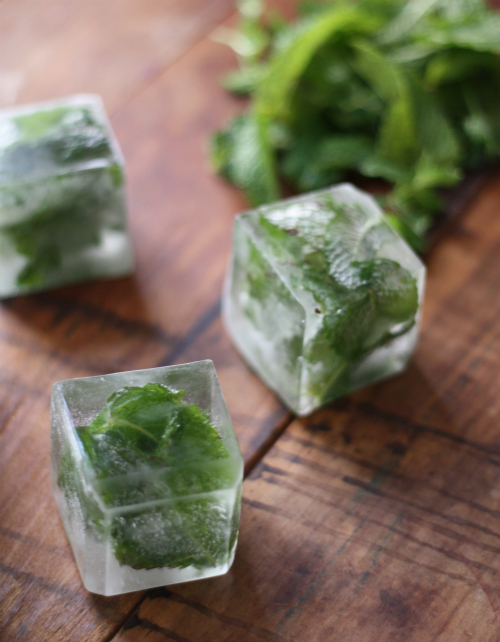 We've been incorporating these mint infused ice cubes into what we like to call "inside out mojitos" over the past few days throughout the heat wave to stay cool and refreshed. 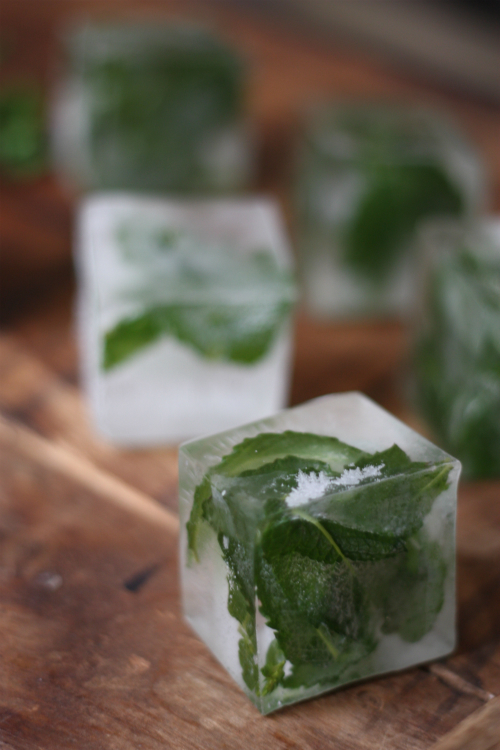 We love how the icy cold hints of mint unravel into the drink with each sip we take as the cubes begin to dissolve and disperse. Stay tuned for Tim's "inside out mojito" recipe coming up next! Have you tried infusing ice cubes before or feel inspired to try it now? These infused-cubes will work with all sorts of herbs, edible flowers, and even fruit. We'd love to know what you'd try freezing and what type of cocktail (virgin or not) you might test them out with. 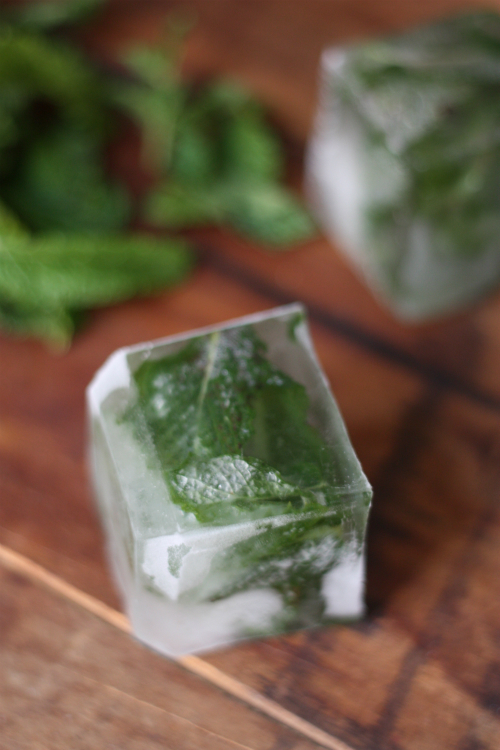 We're thinking these mint-infused cubes would go great in everything from a tall pitcher of lemonade to a fresh glass of water with a thin slice of lemon just to freshen up the taste and watch the mint slowly dissolve. We used to infuse ice cubes with lemon rinds... they were a fun citrus added to cocktails, as well as being pretty :) Those mint ice cubes look so refreshing and beautiful, I'm definitely trying them out! Thanks Lauren — lemon rinds sound amazing. We've loved following along with your home renovations and think your new office looks great! A timely idea. I've been into mint green tea over ice lately, and this will pretty it up nicely. Lauren, love your idea of using citrus. I was wondering, do you use bits of whole rind, including the white pith, or just the zest? Scraping off the pith can be such a pain, this would make lemony cold drinks twice as easy. Great idea! Lemon or Lime rinds! Thanks! I'm so doing this tonight! Love to hear how it went! My friend made ice cubes with mint leaves and cranberries for a Christmas party one year. They were beautiful and festive, everybody raved about them! To be honest, I don't remember what cocktails we were making with them, but I guess that shows the cocktails worked, and how remarkable the cubes were! Oh what a great idea — what a fantastic way to bring a little festivity and color to a wintertime cocktail as well. These are great, I'm gonna grab a bunch of mint from the patio and make a batch. Great with just lemon & water. If you boil the water first, the ice cubes will be clear and the details will be easier to see. Wow we will have to try that! Thanks for stopping by. i tried this with my cucumber/lemon infused water. After the ice cubes melted hours later the mint turned black and tasted spoiled. has this happened to anyone else/ what do you recommend?